Are You Smarter Than Chess for Linux? The classic, time-tested game of pure skill called chess is available for Linux, and it is called…Chess. Chess games are plentiful on many different platforms, and this is one version that is available for Linux. It features a GUI, simple pieces, and simple play mechanics. Linux Mint is a superb operating system, but its default software manager is rather lacking. We can install a better software manager that looks sleeker and is easier to navigate than Linux Mint’s Software Manager. This article shows how to install the gnome-software program, which is the same user-friendly software manager seen in Ubuntu and Xubuntu. Yes, we can use it in Linux Mint. i7z – What Is Your i7/i5/i3 CPU Doing? Well, ponder no longer because the command line program i7z (a reporting tool for Intel i7/i5/i3 processors) will answer those questions for you in real time. And if that is not enough, information can be logged to a log file for serious analysis later. Need a quick and easy way to convert between binary, ASCII, decimal, and hexadecimal values? Steganography is the practice (or art) of hiding secret messages in plain view. Take an image file of a flower, for example. Opening the file shows a flower. Whoopie. However, there might be a hidden message encoded inside the bits and bytes of the image data that is not visible unless certain software is used to decode it. The same can apply to text files. You could write an innocent readme.txt file that looks like any other text file of instructions when opened normally. With steganography, you could encode a secret message within readme.txt that includes game cheat codes, secret contact information, a cookie recipe, ASCII art, or whatever else you wish to convey to your accomplice who receives the file. stegsnow is a fun command line program that encodes secret messages in ASCII text files. Use stegsnow to encode a text file with a hidden message, and then use stegsnow again to extract the message from the file. The file’s text contents are not altered, so the file reads the same as it did before encoding. Anyone unaware would open the text file and see the innocent text contents in a standard text editor, but “those who know” would run the file with stegsnow to see a completely different message. Seeking fun with random identities? Need a fake name and address but cannot seem to think of anything? rig is a command line program that generates simple names and addresses for use with registration where you might need a fake name in order to avoid spam or for whatever reason…like just plain fun. What? ASCII art leaves you wanting more? 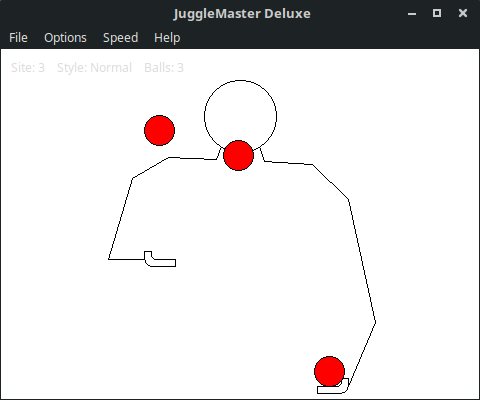 Then, why not have a look at JuggleMaster Deluxe? aajm is a program that lets you watch a man juggle balls using ASCII art. You can adjust speed and styles and more. Here is a related program that achieves the same effect but using a GUI. With JuggleMaster Deluxe, you can watch smooth juggling animations with colored balls to mesmerize yourself or to learn how to juggle.